Step 1: take box apart and turn it inside out (so that the outside is solid brown and the graphics are inside). Step 2: Tape the flaps into the "open" position to give yourself a larger "cube" with one open side (in this case, this open side will be the back wall and I'll use extra cardboard to build that wall later). For the slanted roof, cut a diagonal line from front to back on both sides, cut off the extra triangle piece, and tape the roof back down again. Step 3: Flip the whole thing over. Cut off the side that's going to be the floor (side opposite the slanted roof), and use the extra cardboard to build the back wall (here, it's the open area to the right). 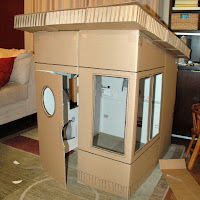 Step 4: Place it right-side up, add the roofing material, cut out doors and windows. Step 5: Add details like window outlines, bricks, etc. to the house with markers. Step 6: Add curtains with scrap fabric and double-stick foam squares (or anything really sticky; these were leftovers from who knows what). I did this because our little guy likes to be in enclosed spaces, like forts, tents, and closets...and it looked too "open" with the windows cut out. Step 7: Place child inside. Use the best utility knife you can find (mine is a very heavy, metal one that I wish I'd had in my first-year architecture classes, when we built everything out of cardboard!). Use a new blade. You might even need to replace the blade during the project. To cut straight lines, use a metal, cork-backed ruler and pull your utility knife along it. For a clean cut, make several passes through thick cardboard instead of trying to cut all the way through at once. Measure the doorway to the room where you'll keep the playhouse. We had to take a door off its hinges and remove the playhouse's roof because the playhouse was an inch too wide. Whoops. Be sure you have LOTS of packing tape on hand. We ran out during construction and some parts aren't so stable. Whoops again! I'm hoping to add some detailing to the outside, perhaps with paint, but that's another project for another day! Wow!!! That is so clever!! My son would love that!! Gotta go to the garage and see if we have any large boxes stuffed away somewhere!! I'm your newest follower from MBC. Just discovered I'm not receiving comment notifications! Thanks for the comments! I love your playhouse! I plan to link up to it on Dollar Store Crafts soon. Thank you for sharing this simple pattern! I need to make one for my 5 yr old grandson and this is just right! As I am disabled and need to keep my promise to him I had no clue what to do til now, so thanks! :) I will be following you for more great ideas. I am a multi-tasking, work-mostly-at-home, urban-dwelling wife, mom, graphic designer, writer and musician. I try to be balanced in my approach to parenting. I love good design, good coffee, chocolate, international travel (not that I'm doing much of that these days), and being creative in all areas of life.